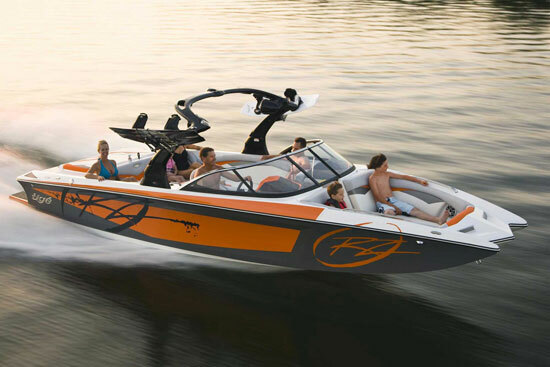 The Tigé RZX2 offers a premium wakesurfing and wakeboarding tow boat in nimble package. Nothing sells like new, as the saying goes, and nowhere does that wisdom ring more true than in the wonderful world of watersports. If you don’t have something new to offer, someone else does—and the dollars flow accordingly. That’s what makes Tigé’s new RZX2 so timely. Following on the heals of the flagship RZX3, the RZX2 does everything its stablemate does, but at a lower price and in a smaller package. 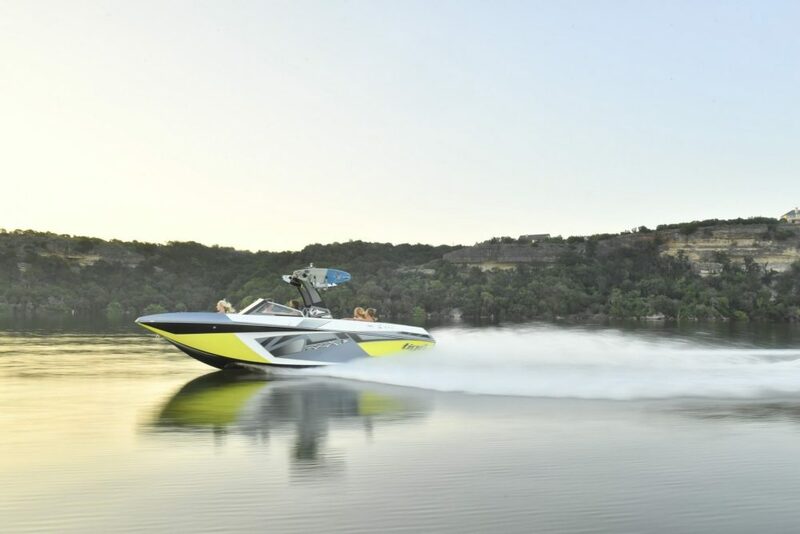 Though it’s smaller and less expensive than many dedicated watersports boats, the RZX3 is ready for some serious wake surfing action. Touch screen displays have become a must-have item on high-end tow boats and the RZX2 delivers with Tigé’s CLEAR User Experience. The display measures 10.6 inches, making it the largest in the industry. It’s also the brightest with full customization, and it’s the only gauge on the entire dashboard. The CLEAR display controls everything, from engine functions to ballast tank levels, rearview cameras, Zero Off GPS-controlled cruise control and rider preference. It’s all there, offset to the right of the steering wheel, making it easy access and clearing forward visibility. 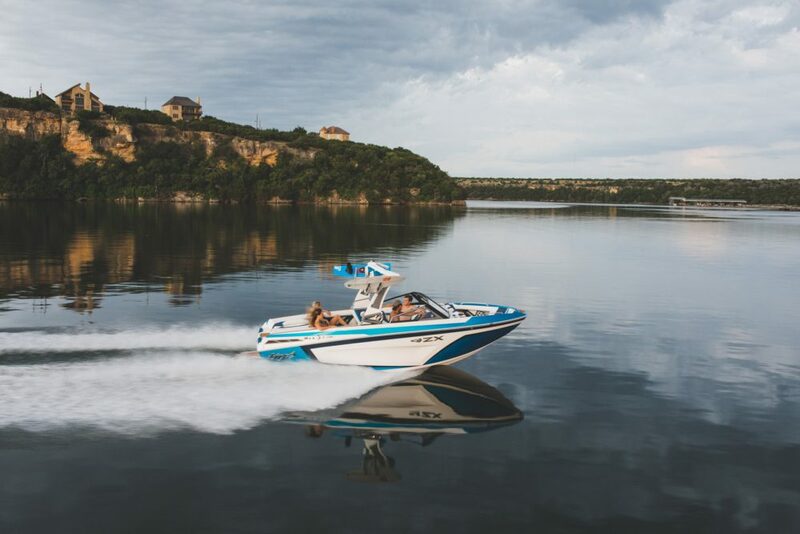 Bluetooth connectivity lets you wirelessly connect your smart phone to the boat’s audio system. Bluetooth also is what enables SurfLink, allowing the rider to change the wakes via a controller worn on his or her wrist. In standard trim (retail price for a well-equipped RZX2 starts around $115,000, excluding a trailer) the RZX2 is ready to rock. With up to 2,700 pounds of under-floor ballast, the Alpha E2 power-folding tower with swivel board racks, and the CLEAR display all included. A mooring cover also comes standard, as does an Indmar Raptor series engine. 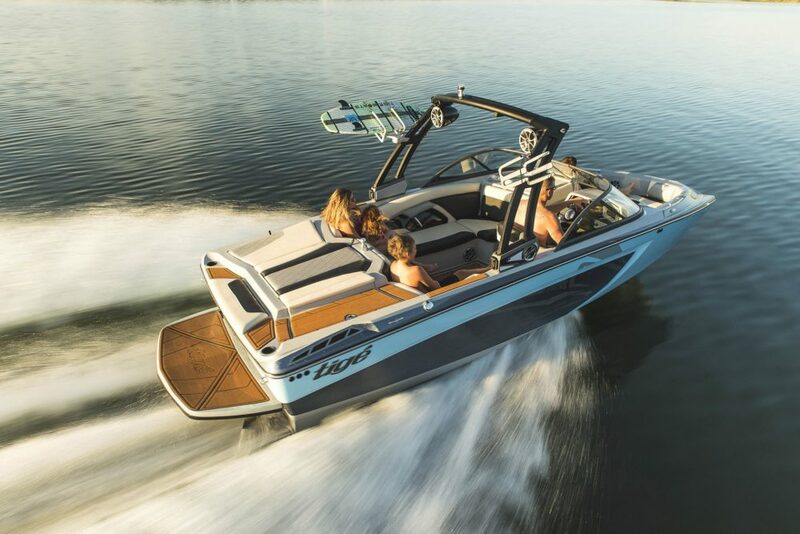 You also get the Tigé TAPS 3 Surf System, which incorporates a trio of trim tabs at the transom of the boat, two on each corner and one mounted at the keel. To create a surf wave on the port side, the starboard side tab extends fully while the port side rises to its uppermost position. That causes the port side of the boat to dig deep and displace a greater amount of water, which is what forms the wave. The center tab gives greater control over the wake’s shape and characteristics. 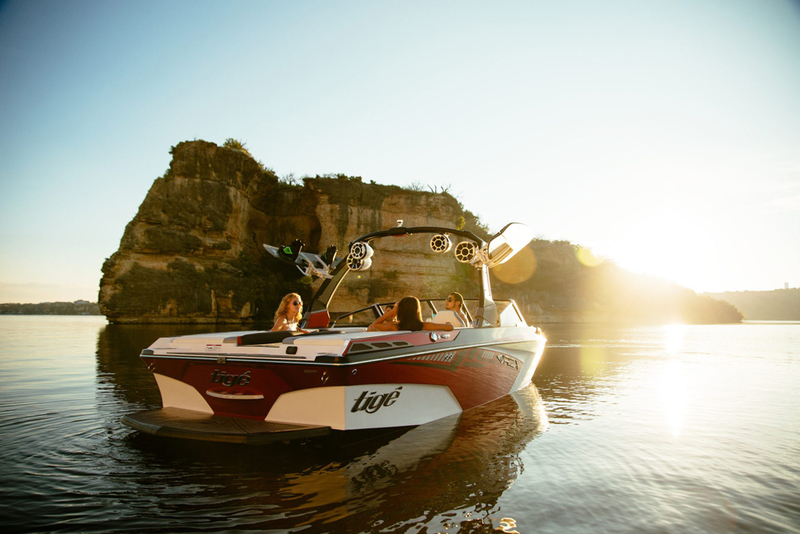 All the tabs work in harmony with Tigé’s patented convex hull, which gives the boat “rocker,” the curvature similar to that of a wakeboard or surfboard. Little known, but still important, the Tigé TAPS 3 system puts the boat into yaw. If you don’t know what that is, well, it’s because it’s more of an aeronautical term than nautical. Yaw means that the direction of the boat is different from the direction of travel. Think of it this way: Yaw exposes more of one side of the boat to the oncoming water. That allows for an asymmetrical release of water off the hull sides, concentrating the energy on the surfing side of the boat—yes, it is amazing what they’re doing with tow boat physics these days. Don’t let looks deceive you; the RZX2 is one seriously teched-out towing machine. You’d be hard-pressed to find a better-equipped tow boat at any price or length. The all-new RZX2 does it all in a manageable-size platform that should appeal to a broad section of the market. 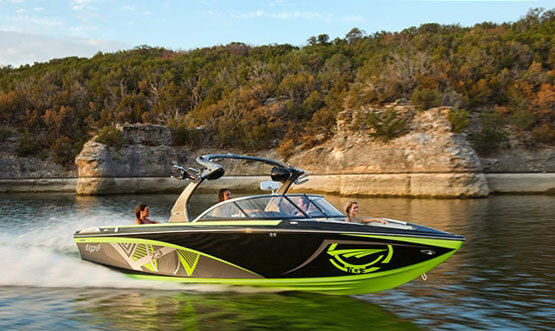 Other Choices: Watersports lovers towing in similar waters will also check out boats including the Centurion Ri217, the Malibu Wakesetter 22 VLX, and the Super Air Nautique G21.